I have mixed feelings when it comes to my recap and review of the 2015 REVEL Canyon City Marathon, so I’m going to break it down by the race elements. I love a relatively small marathon (1,199 finishers) and a small marathon expo is just fine with me. I want to be in and out and not on my feet for a long time. This expo was held at a company warehouse in Azusa with ample parking. 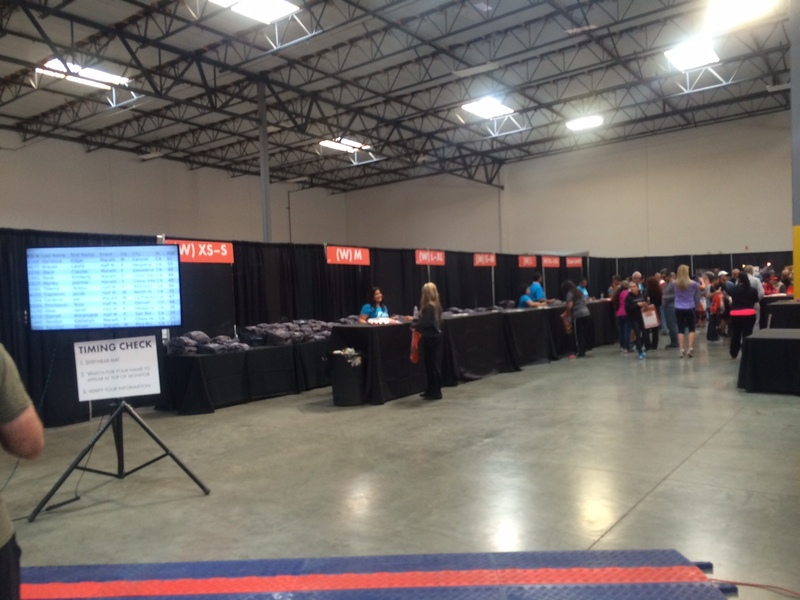 I had no trouble picking up my bib, gear bag, and t-shirt. 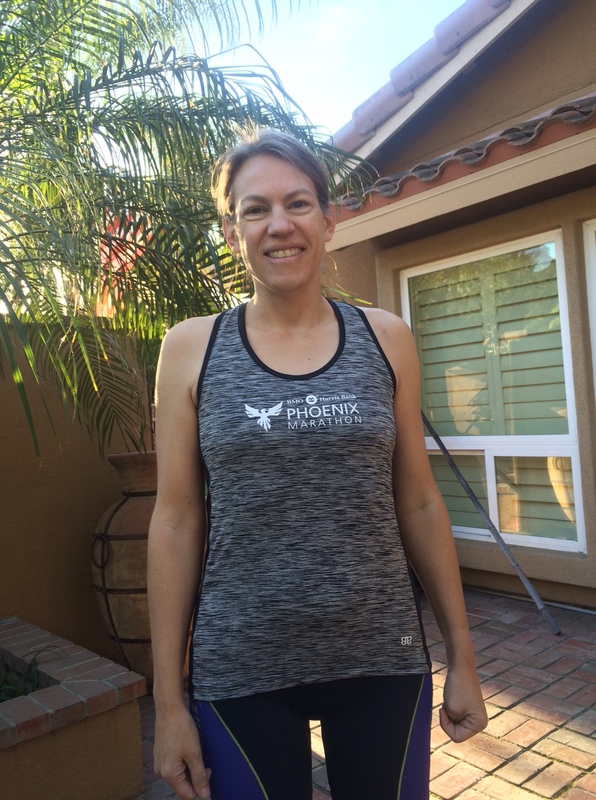 This race offers a lot of runner-friendly features, one of them being a t-shirt exchange at the expo — if the size you ordered doesn’t fit you can trade yours for another size, or you can pay to upgrade to a long-sleeved shirt or tank top! It was nice to be able to check that my timing bib was working and that my name, age and gender information were correct in the database. The timing mat at the expo confirmed that my bib timing chip was working and my information was correct in the database. The race did a good job communicating the with runners about the location of the parking lots and bus pickups for this point-to-point course. Unfortunately, while the parking map said we could just plug “701 E. Foothill Blvd” in Azusa into our navigation system to get to the full marathon parking, when I did that on my iPhone it directed me to a dead end in a new subdivision of homes! And I know I wasn’t the only one, because there were at least four cars driving around that subdivision at 4:30 a.m. and a lot of runners panicking about making it to the buses before the last one left at 5:00 a.m.! I plugged the address into my car navigation system and that took me to a road that was blocked off for the finisher’s chute! I drove around in a big circle and in a stroke of luck eventually made it to the right entrance. The irony of the whole thing is that I’d written down directions on paper before I left and I had them in the car with me, but I couldn’t see them in the dark and just blindly relied on the iPhone. Never again! 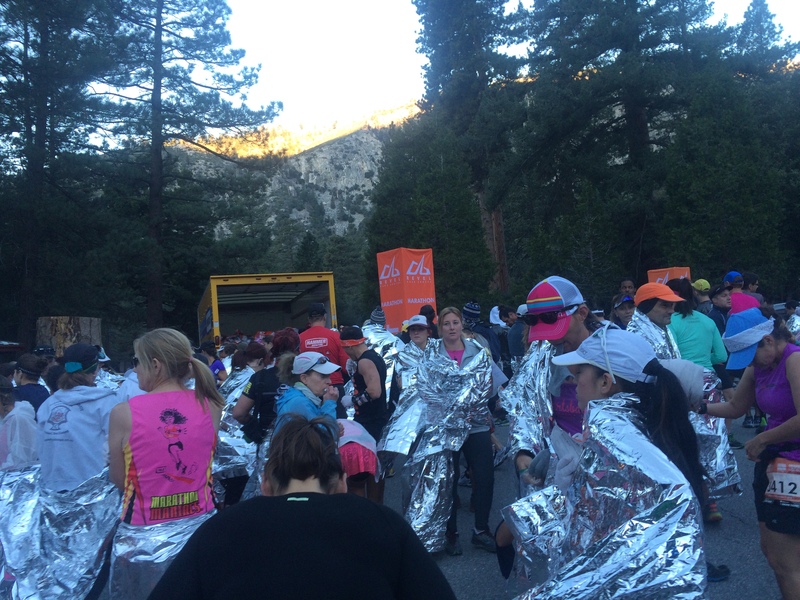 I boarded the bus at 5 a.m. (there were still several other buses so I know people were able to board after that time) for the 1-hour bus ride up to the race start in the San Gabriel Mountains. Tip: Make sure to board a bus with a bathroom! It’s a long ride to the start and the race nerves can get the best of you. Plus, it’s nice to use the warm facilities on the bus before you step out into the cold at the top of the mountain. It wasn’t as cold at the top as I’d expected, maybe 45 degrees? The race goodie bag included gloves and a mylar blanket. I brought hand warmers (a brilliant suggestion by Hungry Runner Girl) and those kept me toasty and happy. It looks colder than it was. Plenty of people were shivering but I think that was more out of nerves than cold. A hat, sweatshirt, sweatpants, gloves and hand warmers kept me plenty warm before the race. As you can see it was a gorgeous day for a race. There were plenty of porta-potties and I never waited in line more than five minutes, even as it got close to the race start. I ditched my sweatclothes in my gear bag and had that in the truck by 6:45 for the 7 a.m. start. At the very last minute I tossed my hat and mylar blanket but kept my gloves and hand warmers (tossing those at mile 3). It was so warm I decided not to wear my arm warmers and just went with shorts and a t-shirt. The course starts at the Crystal Lake Cafe at the top of the 39 in the San Gabriel Mountains National Monument. It’s just a spectacular location for a race. Out of respect for those in the campground next door to the start (I assume) there was no music at the start and not even a bullhorn for announcements, a national anthem, or starting horn. We started at exactly 7:00 a.m. with a countdown by the race director and the crowd. I love running downhill and the speed that comes with it, and the first half of the marathon course is a downhill lover’s delight with over 4,000 feet in elevation drop. While I practiced on the course in training (see my 20-miler REVEL Canyon City course preview for more photos of the course), in retrospect I should have practiced the downhill running at race pace. As it turns out, running those 20 miles at a 9:00 easy pace did not prepare me at all for running the first 13.1 miles at a 7:25 pace! While people warn you that downhill running will trash your quads, I didn’t find that to be true at all. What hurt were my calves! Perhaps my form changed as I ran faster, or perhaps I just wasn’t well-trained enough to hit that pace during the race. I took a calculated gamble on letting my legs fly on the downhill, and I paid for it. Every race is a learning opportunity and now I know what I would do differently for a downhill race: in addition to doing wall sits to strengthen my quads, I would do lots of calf raises, and I would log several downhill miles at race pace. This course could offer a huge PR if you train properly for it. I wasn’t the only one who got chewed up on the first half and spit out on the second. I bet if you looked at the race results you’d see a lot of positive splits by a huge margin. Many people were walking up the hills around miles 14-16 and 19 and even on the slight downhill in the last 5K of the race. 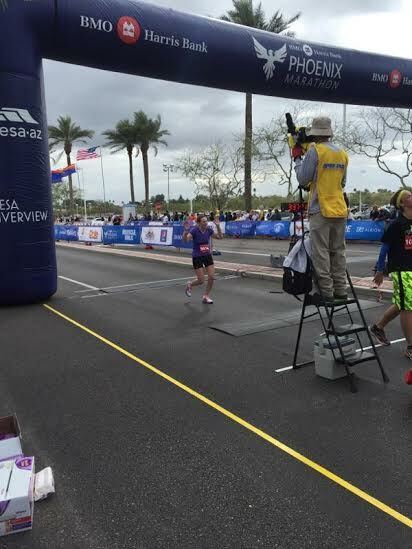 I should mention here that every single runner in the full marathon cut the course. You’re supposed to stay to the left of the cones (the right lane was open to occasional traffic guided by police cars), but I did not see a single runner adhere to that. I tried but gave up. The aid stations in general were well-stocked and manned by enthusiastic volunteers, which is especially important on this course since spectators are not allowed on course until about mile 23. However, the aid station at the half marathon point (which you’d expect to be very well supplied since it was the start for the half marathon race) was lacking. A few volunteers held out cups of water and one cup of sports drink. I reached for the sports drink just as a guy behind me was calling for sports drink. When I took that last available glass, the guy yelled, “F***ER!” That took some of the wind out of my sails for sure, but I shook it off as best I could. I’m hoping karma took care of that guy. The course hits some rolling hills over the next six miles, nothing too troublesome as long as you run by effort and not by pace. As I said though, several people chose to walk those hills, including me at some points. The 3:25 pacer passed me at mile 16.4. I wasn’t surprised and didn’t even try to keep up. I did hope to keep ahead of the 3:35 pacer. The 3:35 pacer passed me around mile 23. It was very motivating to me to see him holding up that 3:35 flag and I hung on behind him for dear life. I wanted to come in under 3:36:58 — my PR from the Phoenix Marathon last February — and I thought if I could just keep him in my sights I would be okay. WRONG! The 3:35 pacer completely fell off the rails and started walking in the last 5K. He finished behind me, and I finished in 3:39:08. I sure could have used his help in those last difficult miles. The last mile or two of the course was different than last year’s and I’m sorry to say it wasn’t an improvement. I ran the 25th mile okay but the 26th felt uphill until the last two turns into the finisher’s chute. Overall I’m happy with my time, especially given that I qualified for Boston 2017 with 15:52 to spare (I’ll be in the 45-49 age group for that race and the women’s standard is 3:55). I really had high hopes for this race though and I wish I had done a few things differently. It just wasn’t the joyous experience I’d had at the 2014 REVEL Canyon City Half last year, or on my 20-mile training run. 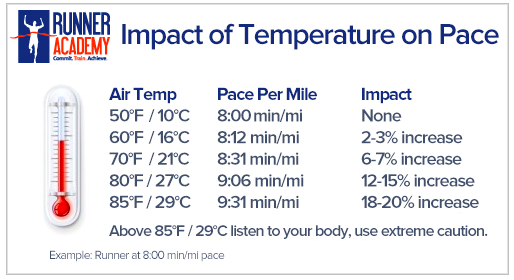 I can finally admit to myself that if I want to run a BQ effort, it’s going to take a level of mental and physical output that takes everything I have, to the exclusion of a joyous race. Which leads me to the conclusion that I’m going to run Boston 2016 for fun and for the experience! Thank goodness I have that on the horizon. I can enjoy a month of recovery workouts on the bike and in the pool and on the roads, and then training for Boston begins in December. Would I discourage someone from running the REVEL Canyon City Marathon? Absolutely not! It’s a gorgeous course and a well-run (no pun intended) event. But if you’re going to go for the full, take my advice and strengthen your calves and quads. Practice downhill running like I did, but take it a step further and practice downhill running at race pace. And then go out and get that PR! Would I encourage someone to run the REVEL Canyon City Half Marathon? Absolutely. It remains my favorite race ever to date. All the fun of the downhill and the views without the punishing of the extreme elevation loss. 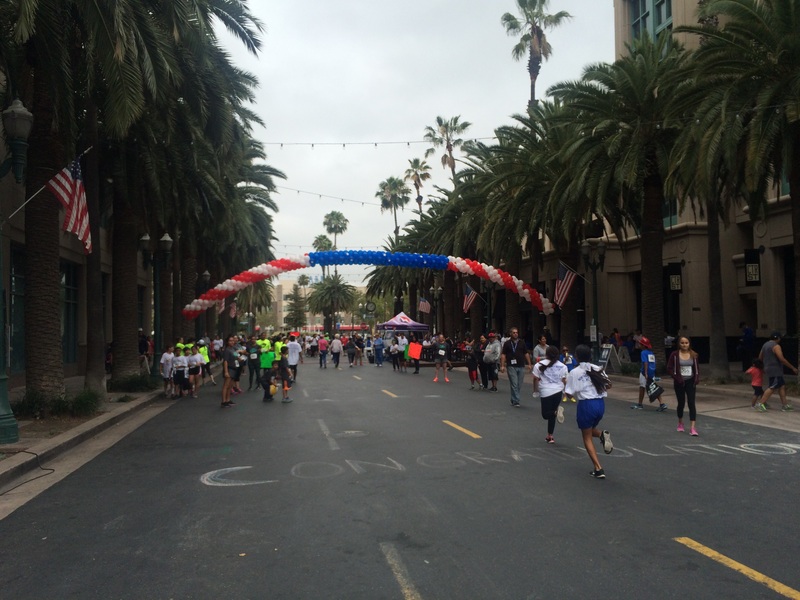 I love running new-to-me races and the 16th Annual Downtown Anaheim 5K Race did not disappoint! The race offered free race morning packet pickup in addition to early pickup, which meant that I could sleep until 5:15 a.m., scarf down some oatmeal with brown sugar and a cup of coffee with milk, and hit Harbor Boulevard at 6 a.m. for the straight shot south to downtown Anaheim. I arrived at one of the two parking structures on Oak Street that had free, ample parking and I had no trouble finding the check-in table by 6:25 and the porta-potties by 6:30. No waiting in any lines! For more information on the cardiac risk associated with endurance events you can also listen to this great Runner Academy podcast: How Safe Is Marathon Running for Your Heart? (And when I say “cardiac risk” I am not talking scary hype, just the facts about the actual low level of risk and how to assess your personal cardiac profile). Speaking of hearts, mine was beating pretty quickly with race jitters as I waited on the starting line. After a live rendition of the national anthem, the race began promptly at 7:30 a.m. under gloriously overcast skies, 63 degrees and 80 percent humidity. I hope next year the race director has volunteers holding up minute-per-mile seeding suggestion signs in the self-seeding corral because I highly doubt the dude in cotton Bermuda shorts (no joke) who tried to place himself in front of me five rows from the start could run 7-minute miles. And I’ve never experienced more jostling at the start of a race. If I wanted to be elbowed I’d do an Ironman swim. Anyway, it is thankfully a relatively small race at about 850 participants and it soon thinned out on the wide straight streets of Anaheim. Unfortunately one of the train track crossing bars was stuck down and the course police directed us on the slightest jog around that. The announcer assured us the course wouldn’t run long and indeed, my Garmin measured 3.13 miles. Besides, this year’s winner clocked a course record so who am I to complain? In spite of my best intentions and 1-minute warm-up intervals at race pace, I started the race a little too fast and had to settle into a 7-minute pace. The first mile seemed to fly by. My goal then became to “maintain.” Funny how mantras just pop into your head as you run. Mile two was good but getting harder, and mile three was a real challenge. I tried to walk (run) that fine line between leaving it all on the course and actually blowing up on the course. I did pretty well but my pace slipped a little. Perhaps I was demoralized by the woman who passed me as she pushed a jogging stroller (I joke — I wasn’t demoralized, I was awed!) I ended up finishing in 22:19, a PR by 1:25 over the iCureMelanoma 5K last May. Turns out my time was good enough for second place in my age group! I stuck around to collect my award but the timing company experienced a glitch and it couldn’t confirm the official results in time. Those came out at about 5 p.m. today and the awards will be put in the mail on Monday. Racing a 5K was quite the experience after all my marathon training and racing. I followed this 5K training plan for advanced runners from About.com and I feel like it did the job well. I was surprised to note that my lungs gave out before my legs, and my arms were sore. Man I must have been pumping to keep up that pace! What’s your favorite race distance? I like to mix it up. I would like to run another one-mile race some time but there aren’t too many around and the local ones haven’t fit in my schedule. I love an 8K — I feel like that is a nice middle distance race. 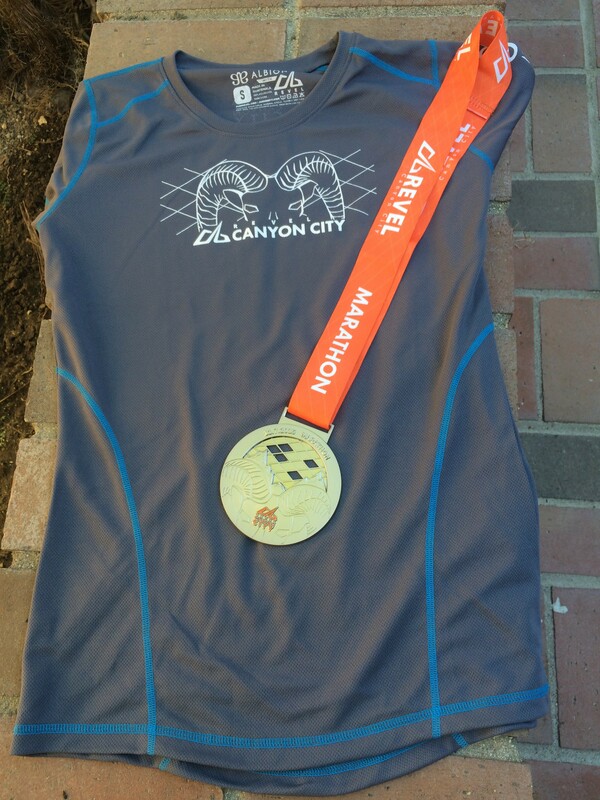 My favorite race of all so far though has been the Revel Canyon City Half Marathon, just because the course was so spectacular in the San Gabriel Mountains, and I felt like I was flying down the course. I had a fantastic morning with my family and friends at the iCureMelanoma 5K in Fullerton, California today! It’s a great community event for runners, walkers and anyone interested in supporting melanoma research. What started last year with our core group of book club members on Team BookIt! grew this year to 53 people on Team Beckman Coulter. 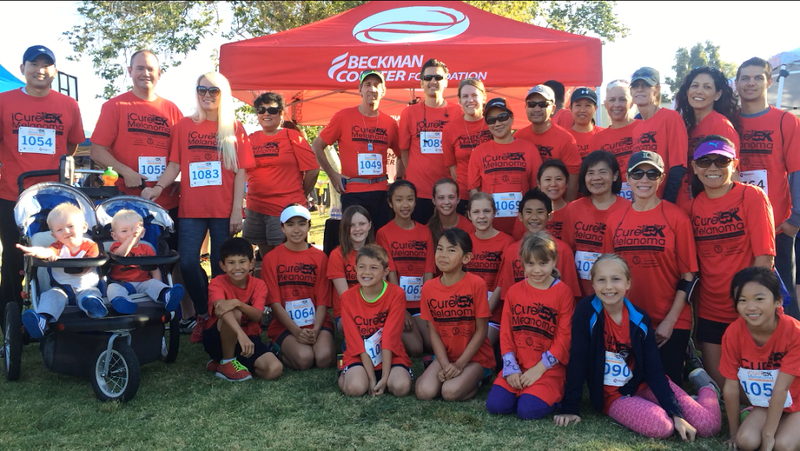 With the generous help of the Beckman Coulter Foundation, our team raised $5,418 for melanoma research at University of California, Irvine (UCI)! We won the top prize for fundraising, and it felt really great to contribute towards the $100,000 that was presented to UCI at the end of the race. We thought we were in the running for the prize for largest team but Team Mac came in first with an amazing 107 members who came out to honor the memory of Michael Gerard MacDonald, a man lost too soon to melanoma in 2009. So really Team Mac’s victory is a huge win-win and it’s simply wonderful that so many people participated to support much-needed melanoma research! My eldest daughter and I ran the race in the competitive wave that started promptly at 7 a.m. The course runs over challenging terrain — a mix of grass, road, and dirt. It forms a lollipop shape as it runs out to and around gorgeous Laguna Lake, which shades you with beautiful trees along the park path. I cannot say I’d recommend it as a “fast” course but man you wouldn’t know it when you look at the finishing times. The winner came in at a blazing 18:54! I managed to pull off a PR of 23:44 for 1st in my 41-50 age group of 33 women. And my daughter also set a PR (by 4 minutes! ), coming in at 24:11 for 3rd in her age group! My husband and middle daughter had fun on the course in the 8:00 a.m. open wave with many of our friends. There were tons of great vendors at the finish line and we feasted on pizza, Italian ice, peanut butter and banana sandwiches, and protein bar samples. Of course there were also sunscreen samples on hand, and my girls were thrilled to find free nail polish samples at the Solfingers booth. I am definitely going to check out the Solfingers line of sun protection gloves and arm sleeves. I’ve been wearing my plain blue Phoenix Marathon arm warmers for sun protection but the Solfingers sleeves and gloves offer several super cute designs. I’ve got my sights set on another 5K at the Downtown Anaheim 5K Run on June 13, 2015, and we are already planning to come back next year for the 10th Annual iCureMelanoma 5K! What do you use for sun protection? In addition to wearing a visor, sunglasses and as much clothing as I can tolerate, I like Coppertone Sport sunscreen. The dermatologist Dr. William Baugh who puts on the iCureMelanoma 5K recommends Neutrogena as his favorite brand. (Tip: he says it does not matter whether you use the spray or cream formula of sunscreen — the best sunscreen is the one you will use! If you have trouble with sunscreen running in your eyes he recommends a silicon-based sunscreen for athletes). I also try as much as possible to avoid peak sun hours (10 a.m. to 2 p.m.) and I choose a shady route whenever possible (not always easy in sunny Southern California).